Is it a DUMP or a recycle bin? I don’t understand what someone is thinking when they dump their “recycle” items next to the recycle bin. Obviously their initial intention is to do the right thing by recycling. Do they realize that what they are actually doing is littering? The recycle company does not pick this stuff up. If it actually makes it’s way into the bin, it is because a conscientious person has stopped and taken the time and effort to clean up their mess. If anyone knows who does this, would you please ask them to stop? If the bin is full when you get there, come back when there is room. I’m so glad someone finally posted about this issue, thanks Chris! We’re going to lose the dumpster if the dumping continues plus it looks horrible and really makes us look like we’re slummin’ it here in SP! I for one was very happy to see the County place a recycling bin in our neighborhood but I am, however disappointed that individuals continue to use this site as their personal garbage dump. Who are these irresponsible knuckle heads to expect someone to clean up after them? I’ve personally seen computers, old TV’s and mattresses just to name some of the in appropriate materials. Now that we have pick up recycling at our homes, I propose the County remove the bin and lets eliminate the urge for some people to be pigs. I have been collecting mail that I find out side the bin and will be calling these people to clean up their remains from our neighborhood once the snow gives it back. Every time I have visited the dumpster it has been full or very nearly so. Would it be possible to get additional pickups and/or to post a pickup schedule so we know when the dumpster is most likely to be empty? Today I notice someone has dumped their mattresses on the ground next to the bin. The hill is a mess. There is garbage everywhere and it looks like a dump. My feeling is that we can no longer trust the local residents to recycle responsibly. We have spent money on signs that get ignored. 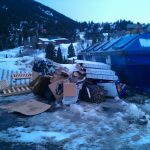 The bin is convenient for overflow recyclables, but now that we have curbside recycling, do we really need it? Not at the cost of what it looks like right now. I’d rather run into town and recycle than look at that mess. I’m not sure who is charge of the bin. I assume it’s the county, you can call them for the schedule etc. The recycling bin / garbage dump issue does’nt seem to be getting better. People still continue to use this facility as their personal landfill. 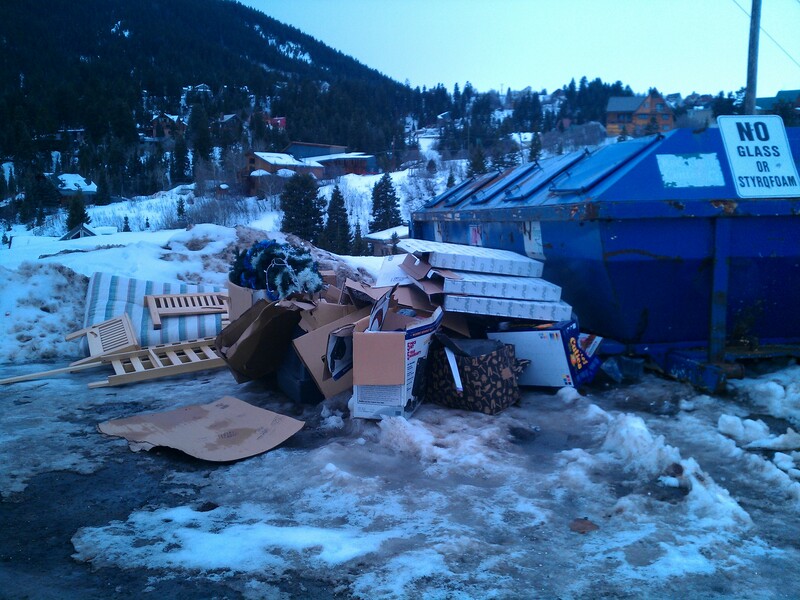 Now that the snow has melted, take a gander on the hill side behind the dumpster. It looks like the county health department should be involved. The unconscionable acts of a few are having a negatve impact on our way of life. Lets remove this eye sore NOW!